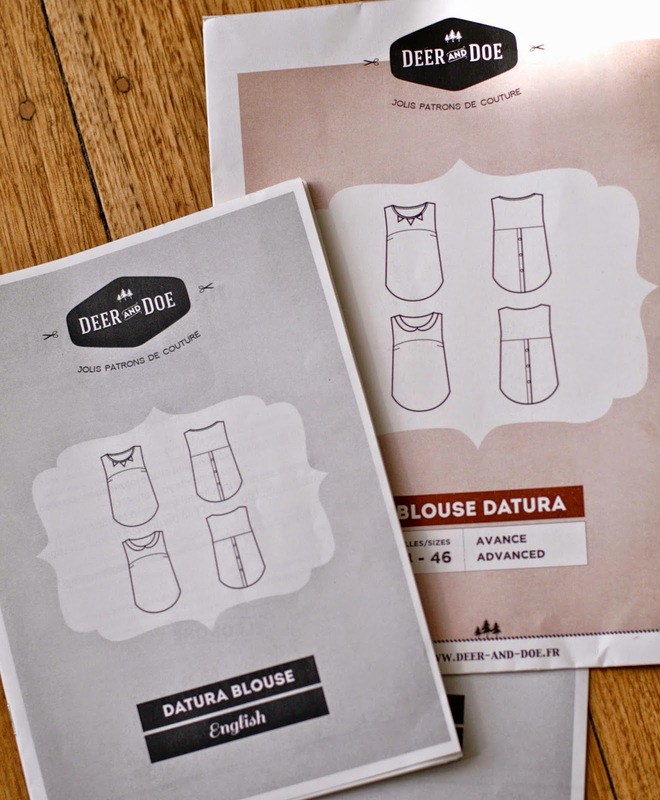 The beautiful Datura sleeveless blouse pattern by French company Deer and Doe is marked for 'Advanced' level sewers. But don't be afraid! We've put together a photographic tutorial to help. In this tutorial, over three posts, we show the construction of View A (to be used in conjunction with the instruction booklet). Tutorial Part 1: Construction of the Lined Yoke. Select your fabric/s and pre-wash. Choose your size, trace off your pattern and cut out your fabric pieces according to the layouts in the instructions. NB: for View A with the bound neckline, you will need 7 - 8 lengths of the bias tape, using the template provided in the pattern. If you are able to cut your bias in longer continuous lengths, this will be preferable since you will end up with less joins. Choose a stable woven fabric with some softness and drape. The yoke is fully lined. If you are using a patterned fabric for the outer yoke it can be a good idea to use something plain for the lining so you don't have pattern show-through. This tutorial features a 'wearable muslin', made from a stashed remnant of printed cotton voile, and some white cotton (from an old baby bedsheet!) for the lining. So, let's get sewing! Pin back yoke and back yoke lining right sides together. Measure and mark 3/4" from top shoulder, and do not stitch beyond this mark. Sew neckline and armholes and trim seam allowances as directed. You will end up with these sticking out untrimmed bits at the shoulders. Pin front yoke and front yoke lining together. Measure and mark at top shoulder points as you did for the back. Measure and mark the stitching line around the cutout sections (5/8" in from edge) to ensure accuracy. Stitch as directed, lifting the presser foot and pivoting at the points. Trim the seam allowances, then snip off the points and snip into the V-shapes, almost up to the line of stitching. Turn in the right way and press well. Flip out those untrimmed ends. (That's a floral ironing board cover underneath.) There will be a bit of puckering around those ends; they won't sit perfectly but that's okay. There was some pulling at the V-points so I opened it up and snipped a bit more into the seam allowance there to help it lie flat. Tuck the front yoke inside the back yoke (which is still inside out), so that right sides are together. Push the front shoulder straps inside the back shoulder straps until the untrimmed ends meet - outer to outer and lining to lining. Yes, you'll probably have slightly puckered ends meeting slightly puckered ends, which is fine. What's most important is lining up the edges, as you can see being pinched together below. Now sew each pair of ends together with a 5/8" seam allowance. Now reach inside, in between those ends, and pull that middle layer (the front yoke) out a bit. Open up the seam allowances on either side and carefully align. Sew along the seam line, over the opened up shoulder seam allowances. Make sure the inner layers of the front yoke are bunched up in the middle, away from where you're sewing. Trim off the sticking out bits (this is shown from the lining side). Now, carefully turn the whole thing in the right way. Sewing magic! Your shoulder seams of outer and lining are neatly finished. Give it a press and give yourself a pat on the back for making a fully lined yoke. Hooray! 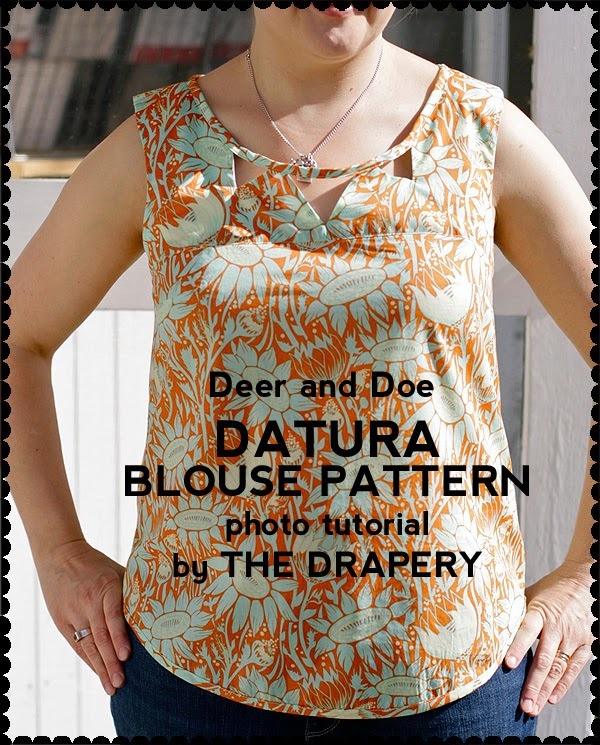 In the next post, we show you how to finish the neckline with bias tape to create that cutout look. And in the final post we attach the bodice front and back and finish it all off. Do you know where to buy this pattern in Australia? We love to know who's reading and what you think so please leave us a comment! We'll also try to answer any questions you may have. About racism (let's not beat about the bush). The Drapery. 308a Glen Osmond Road, Fullarton, Adelaide, SA. Open Wed-Fri: 10am - 4pm, Sat 12-4pm. Powered by Blogger.